In 1994, the segregationist apartheid policies came to an end, and South Africa has been since constitutionally making a number of changes to geographical names in the country. Before the election in 1994, on 15 December 1993 the South African Parliament voted to restore citizenship to residents of so-called independent states of Transkei, Bophuthatswana, Venda and Ciskei, estimated at about 10 million. 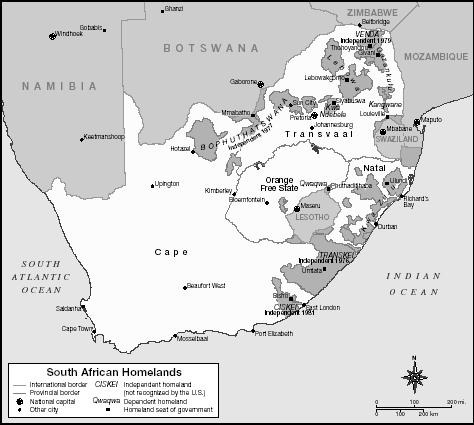 During Apartheid, starting from the late 1950s the South African Government attempted to divide South Africa into a number of separate states, called homelands, for Blacks. Under the homeland system, each state was supposed to develop into a separate nation-state for a different ethnic group. According to the Promotion of Bantu Self-Government Act No. 46 of 1959, Black people were classified into ethnic groups for whom a so-called homeland would be established. Approximately thirteen per cent of the land which represented fifty per cent of South Africa's arable land was reserved and divided into ten Black "homelands" amongst eight ethnic units (Davenport, 1977: p. 268). Four of the states were given independence (Transkei, Ciskei, Bophuthatswana and Venda), although this was never recognised by any other country. Each homeland was supposed to develop into a separate-nation state within which the eight Black ethnic groups were to find and grow their separate national identity, culture and language. The aim was to strip Blacks of their South African citizenship and ensure a demographic majority of White people within South Africa by having all ten Bantustans achieve full independence. In addition, urban townships were established to provide a readily available supply of labour, but had to be far enough away enough from white residential areas. When the apartheid government came to an end, it was important that the democratic government began to change the previous structures to a democratic one, including changing the way in which the cities, townships, and settlements were physically organized according to racial/tribal differences. These has posed challenges to the government when trying to integrated poor non-white with more privileged white areas particularly in the urban areas. 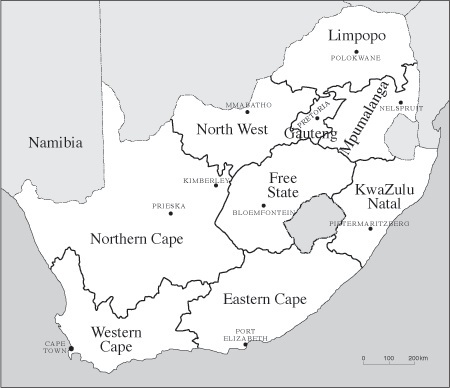 One of the major changes was the redrawing of provincial boundaries and divided the country into nine provinces: the Eastern Cape, the Free State, Gauteng, KwaZulu-Natal, Limpopo, Mpumalanga, North West, the Northern Cape and the Western Cape. The nine provinces of the Republic of South Africa and their boundaries were established in Schedule 1A to the Interim Constitution. The then existing four provinces (Cape Province, Orange Free State, Transvaal, and Natal ceased to exist in 1994. 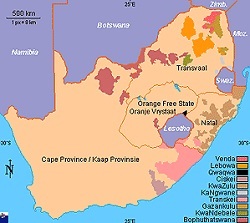 The Cape Province was replaced and divided into three provinces namely: Western Cape, Eastern Cape, and Northern Cape; while the Orange Free State became the Free State; Natal was renamed KwaZulu-Natal, and the Transvaal was divided into Gauteng, Mpumalanga (initially Eastern Transvaal), Northwest Province, and Limpopo Province (initially Northern Province). The former homelands/Bantustans which were independent states namely Transkei, Bophuthatswana, Venda and Ciskei ceased to exist on 27 April 1994 and were re-incorporated into the country. In 1998, the South African Geographic Names Council (SAGNC) was established as an institution which oversees the process of name changes, i.e. street or city names. SAGNC advises the minister of Arts, Culture, Science and Technology, guides the change and standardization of official names, and helps provincial geographic names councils. The renaming process is part of a national drive to make South African cities and street names sound more inclusive and less reflective of the colonial and apartheid past. For example, the cities of Pietersburg, Louis Trichardt, and Potgietersrust were named after Afrikaner leaders. They became, Polokwane, Makhoda, and Mokopane.